Summary Barebones cloud backup and storage solution that gets the job done, but not terribly quickly. Cons • Not really unlimited - Limited Transfer speed, Limited total bandwidth, Limited file size. OrbitFiles is a relative newcomer to the cloud backup scene, providing an "Unlimited" backup option in the wake of Mozy's exit from that option. I use quotes because OrbitFiles is actually very limited, but we'll get into that in a bit. Let's take a look at the features and pricing. OrbitFiles is very Greek mythology oriented. 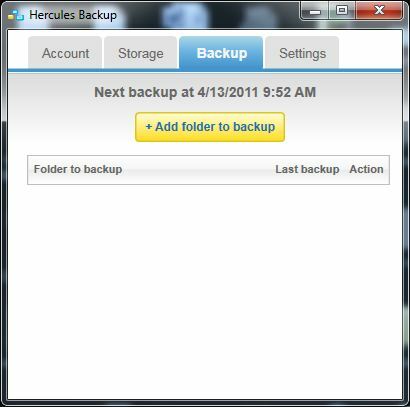 The Windows-only desktop client is called Hercules Backup, as it does the heavy lifting (get it?). The actual subscription plan have two options called Zeus and Olympus. Honestly, if we're going for Greek mythos, Hercules never exactly saw eye-to-eye with his father, so I'm unsure that the analogy works. Ignoring the questionable marketing, the Zeus plan is the entry-level subscription plan and will cost you $5 a month, or $45 a year. For this you get 200 GB of bandwidth each month to upload files of up to 1 GB maximum size. So don't expect to be uploading movies or any really big files. You will have access to live support, file sharing via URLs, and remote access over the web. Olympus is aimed towards the business users with a higher bandwidth limit. Additionally, Olympus accounts can assign additional usernames so that other people can log in and collaborate in the account. Public file pages also are Olympus only, and are basically pages generated by OrbitFiles that people can navigate to, to see all the available shared files. Olympus runs $15 / month, or $149 a year. So, as we can see, there is a limit on monthly bandwidth and a limit on file size. Let's see how it does in use. Installation and setup are straightforward. Sign up for an account, install the software, and you're ready to start backing up. There's no wizard process here, but the system has a pretty basic feature set. The tabbed interface denotes what's available: Storage, and Backup. The Storage tab is for unscheduled uploads, and for managing folders in your cloud storage. The Backup tab uploads files on an hourly schedule. There's no way to change backups to be more or less frequent. I added my "Documents" directory to be uploaded, and had the backup started immediately. This showed another limitation: transfer speed. My bandwidth monitor showed a hard limit of 1.5 Mbps being imposed. There's no option to change this in the client, so it must be hard set. I've placed a screen shot in the gallery so you can see the bandwidth chart. The initial login screen. The settings tab will only enable the app to run on windows bootup. The screen the app opens up to. Not too much to do in Hercules, but he never was terribly bright. Shows the basic account info. Here's where you set up what folders and files you want backed up. Like I said, not much to play with. You can see how the bandwidth is capped here. If it wasn't capped, it would be much more spike-laden. A view of the web interface. Not much to it either. That now makes three limitations in OrbitFiles' definition of "unlimited". It is perhaps to be expected, but OrbitFiles should be more explicit in what they are actually calling "unlimited". Sharing files can also be done from within the client, as well as pulling out embed codes so that you can share large files on public forums. It's an interesting feature, if nothing more than a gimmick. Shared files produce a link you can use, and also would show up on a public page if you were using Olympus. Restore is basic, just like the rest of the system. OrbitFiles maintains backup sets, so you can go back in time and download an older copy of a file, or a file you recently deleted. Downloaded files can then be put anywhere on your hard drive. The web interface allows for mutiple selections of files and downloading them in a zipped container. There are no options for ordering DVDs or hard drives, which is something I always am puzzled by with these "unlimited" storage companies. It's a perfectly good revenue stream to get into, as many people don't want to tie up their Internet connection for days on end. And with OrbitFiles low upload speed, it would be a welcome option. Access is mainly through the Windows client, but the web interface is fully functional. The website is a little rough to get around, but allows you to download files, upload files, move and delete them, and, in general, do all the same things you can do in the client. Support is mediocre. The FAQ is really nothing to write home about. There's no manual, and support is contacted via an online customer support form. If you plan on needing help with something, I would pass on using OrbitFiles. Security is completely undocumented, with only a line stating OrbitFiles uses "advanced encryption". Since they allow upload via the web interface, it can be assumed that files are stored unencrypted unless they are doing encryption processes on the server as other services doI would probably not trust OrbitFiles with any sensitive data, mainly because there are better solutions available. Overall I can't recommend OrbitFiles. It's slow, under-documented, bare-bones, and has a poor web interface. There are plenty of other options, like SpiderOak, Backblaze, Crashplan, etc., that can fill the space much better than OrbitFiles. Take a look at the charts, see what looks best for you, and let us know in the comments!